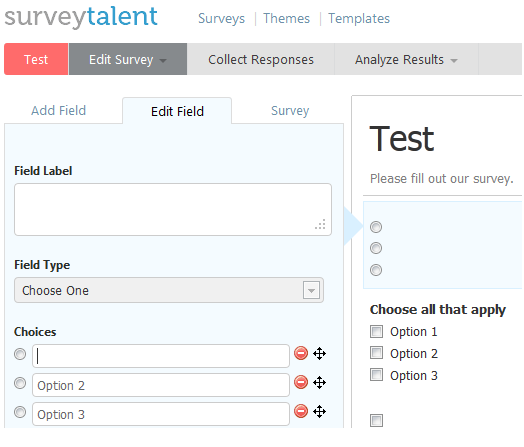 I'm building an internal survey tool similar to SurveyTalent where users have a panel to edit questions. I have a requirement to make the question and however many visble answers required. When they navigate away from the question, alert them that there are errors on the form, and force them to fix them. When they save the entire form. Which of these (or any other options) would be the best way to go about this? I've looked at comparable tools (Survey Talent and Wufoo) which both allow users to navigate away and save questions without text in the question, so they aren't much help. First, if you have a requirement that the incomplete questions have to be finished before the survey is finalized, then you only have two choices: check it when they save the question and check it when they save the form. The strongest reason that you would not want to check when they submit the question is that perhaps the form is still a work in progress and they don't actually have the question written or the answers completed. Allowing them to submit an incomplete question would make it easier for users to work incrementally. I'm assuming you have a listing page of all the current questions. I would make the incomplete questions stick out visually, and maybe even float to the top. That way it's easy to see that there is work still to do. When they finally attempt to submit the form in its entirety, just softly remind them that they have incomplete questions. Don't use in error or warning where a reminder will do. As a bonus, pop up an easy workflow to handhold them through the process. The idea here is that you are not admonishing them for making a mistake, you are just reminding them to finish something. Also, I might add, if your users are non-technical, I would use some other label than "field". If they are all questions, use that. If not, something has got to be more friendly. Not the answer you're looking for? Browse other questions tagged forms validation surveys or ask your own question. For help desk feedback, what's the best Yes/No question to ask?